"I know, as I said, that I'm called middle-class Joe," Biden said at an October rally for the midterms. "It's not meant as a compliment-- it means I'm not sophisticated. That's been my handle for the last 40 years. But I know what made the country what it is: ordinary people doing extraordinary things." Biden is traveling on a short book tour to promote the paperback release of his 2017 memoir “Promise Me, Dad,” detailing his son Beau’s death from brain cancer, which he said kept him out of the 2016 presidential race. “No one should run for the job unless they believe that they would be qualified doing the job. I’ve been doing this my whole adult life, and the issues that are the most consequential relating to the plight of the middle class and our foreign policy are things that I have-- even my critics would acknowledge, I may not be right but I know a great deal about it,” he said. 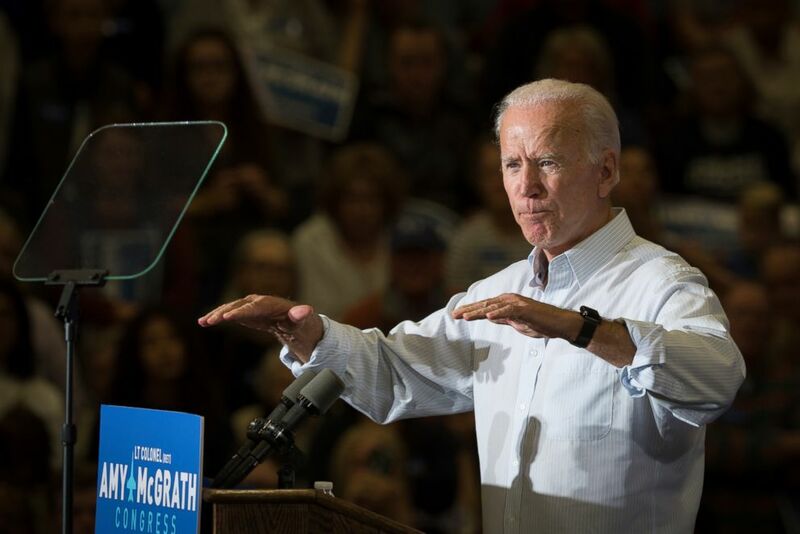 Biden, like many others turning over the idea of a 2020 bid, said at the end of the day running is a family decision, according to the Missoula Current. “I have two young grandchildren my son left who love me and adore me and want me around. I want to be there to take care of them, so we’ve got to figure out whether or not this is something we can all do as a family,” Biden said, according to a CNN report. The moderator, New York Times columnist Bruce Feiler, rattled off a long list of potential roadblocks for Biden, such as his age, the cost of taking on Trump and his history of gaffes. Biden said none of those things scared him. “Whether or not I run, whoever runs, I’m going to break my neck to make sure they win. We can’t have four more years,” he added. Biden spent 2018 on the trail for Democrats in the midterms, with a focus on red states. Political observers have grouped Biden with Sens. Bernie Sanders and Elizabeth Warren in what is becoming increasingly crowded 2020 speculation. ABC News' Molly Nagle contributed to this report.